A live feed from Israel of the longest Blood Moon until 2123 is below (actually the longest eclipse of any kind for over 100 years). Today is the 15th of Av, otherwise known as Tu B'Av. The eclipse will be in totality over all of the Middle East and most of Europe, Africa, Asia, and Australia. Parts of Brazil will also see totality. Totality is longitudinally centered over Russia and Iran. The partial phase of the eclipse begins at about 1:24 PM Central Time on Friday, July 27th. The full eclipse begins at 2:30 PM Central Time. "I will show wonders in the heavens above and signs on the earth below, blood and fire and billows of smoke. The sun will be turned to darkness and the moon to blood before the coming of the great and glorious day of the Lord." Hats off to @Donna for finding this feed! It's streaming live from the Bareket Observatory just a few miles northwest of Jerusalem (and also switching to other observatories in the Middle East from time to time). If anything interesting develops, we will keep you informed. Thank you Donna! Awesome find you made. I've switched out the feeds with the one you found. The one I had before was in Greece. 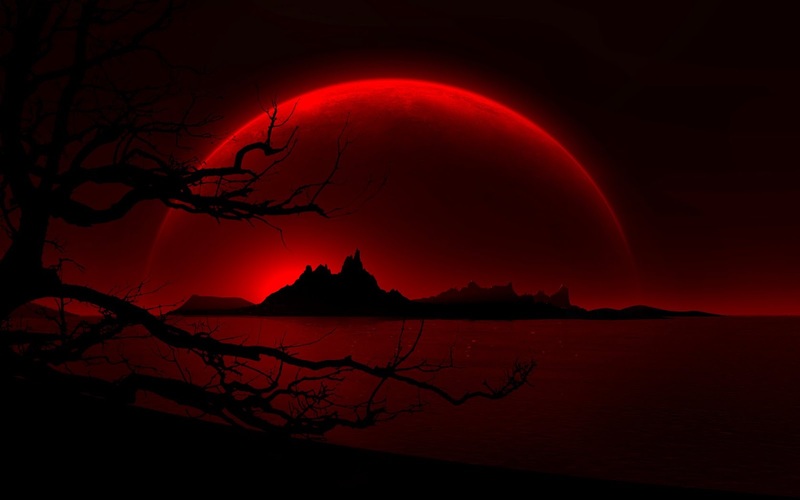 Blood Moon on it's way with the planet Mars, the "God of War" in tow. With Mars right there representing the "God of War" has to be a prophetic sign from Hell that all Tartarus is getting ready to break loose on Earth. Coincidence? I think not. I've not heard to much about this aspect of the prophecy (unless of course I'm just not looking close enough). Yeah, I forgot all about Mars! Totality is 103 minutes: Strong's 103 - "To gather." Today is 7/27: Strong's 727 - harpax (from harpazo) - "to seize suddenly." Not that the rapture is today, but just another little sign of God's unbreakable end times plan. "Now we beseech you, brethren, by the coming of our Lord Jesus Christ, and by our gathering together unto him,That ye be not soon shaken in mind, or be troubled, neither by spirit, nor by word, nor by letter as from us, as that the day of Christ is at hand. Let no man deceive you by any means: for that day shall not come, except there come a falling away first, and that man of sin be revealed, the son of perdition; Who opposeth and exalteth himself above all that is called God, or that is worshipped; so that he as God sitteth in the temple of God, shewing himself that he is God" (2 Thessalonians 2:1-4). Almost rapture "harpazo"/Antichrist time folks! Like Gary said, maybe not today, but soon! The prophetic hints are coming fast and furious these days. Okay, this is bizarre. Our lab mix named Shadow has been begging for a walk this morning/afternoon. Here we sit watching the live stream of the moon slipping under the earth's shadow and she vocalises in such a way that it came out "walk"! Our dog actually said the word "walk" while the moon went red! It came out like a whine and a yawning sound but was distinct and sounded like "wok". Tripping out here and enjoying the show! Later this evening I hope to look at the eclipse from the lunar surface in software to see where the earth eclipses the sun against the constellations. I'm wondering where earth falls against the starry night. Great screenshots! You can rewind the live feed, too, to see it at different stages. I found some moments 10-15 minutes ago where it was very, very "bloody". Curious why they show the mirror image of it, as the dots were opposite just a bit ago. It looks super-bloody red in the Persian Gulf region. Definition: I hide away, conceal, keep secret. It's interesting that Dan is shown in these figures. Dan is missing from the tribes of the 144,000 which has led some to believe that the AC will come from the Tribe of Dan. The scales of justice was their emblem. The same scales symbolised in the heaven being known as the constellation Libra; which just so happens to be the "home" of the king planet Jupiter at the moment! The number of the name Dan ("דן") is 54. Remember, Hebrew uses their letters for numbers so letters have a numeric value! "ן" equals 50. "ד" equals 4. Checking my time-line I noted that 54-days prior to Rosh Hashana/Yom Teruah, 5779, (the *birthday* of our Lord and Saviour Jesus Christ) lands on Thursday, July 19, 2018, the day Israel passed the Nation-State Bill became law. I would also note that July 19, 2018 is 300-days after the Great Sign of Revelation 12 on Saturday, September 23, 2017. Either you believe that G-d put this eclipse in place as a message to the nations it visited or you don't. If for being a message bearer, this is what I found regarding these pin-points. Looking at the lunar eclipse using Stellarium to *stand* on the earth facing side of the moon, it looks like earth and sun were in the constellation of Cancer today. Wowza. Some of those Strong's #s are amazing. Coincidence? @Gary, Yeah, those Strong's #s are amazing. I had no idea that Hebrew words would be so different than Greek. But in retrospect I guess that makes sense. There is a Gentile message as well as a message for the Jew. One messenger, two messages. Finding this was wholly unexpected. Ahem... so you mean NASA live feed, I repeat: N.A.S.A. right?! And you BELIEVE what they show to you, OK? Well, I watched from Germany and there was NO MOON AT ALL in fact. No clouds, no moon, but a few stars. Yesterday eve, it was still full and "shining" so bright I had to close the shutters at night to get some sleep from this torchlight. LOL! And several webcams I checked this morning, not all of them were showing a moon, but only SOME and not always at the proper time frame, in the right size and direction (S/E). Hmmmm.... Now what do I do with this? Just as an add-on: NASA will have its 60th anniversary on 10/1/2018... Very fitting! (Hopefully we're outta here before.) MARANATHA! Wow, you're right! NASA began operations 60-years ago come this Shemini Atzeret!! Wow!!! That day may be more appropriate than you think. Perhaps this Scripture verse fits here: Prov25:2. "It is the glory of God to conceal a matter, But the glory of kings is to search out a matter." Taking Rev1:6 "...and has made us kings and priests...." into consideration, shows us more of what His children are doing in these Last Days. I should have noted, NKJ version. Another nice connection. A lot of those lately! Well Pat, you should have read more carefully though... So before getting into spreading rumours here: NO, I never claimed to believe in flat earth (rather the very contrary) and NO again, the moon doesn't give light from itself and never did (but you should know that even from school too) as this was exactly my reasoning from the darkening sun to prove the fake moon today. You really shouldn't just skim everything superficially but rather read carefully and THINK before you answer to it. MARANATHA! ...and regarding the chemtrail reality: well, since Rachel Reenstras California doctor risked his career to come out with it this year at the latest you can know FACTS about it, even in the US. But if you want to stay a proper sheeple to your government, nobody is hindering you here (I am the least person then to want to stir your comfortable sleep or wake you up to truth). LOL! Let me try to reply to this without sounding as snarky as you do, LOL. Some tv personality's doctor is filmed saying chemtrails exist. If you want to call that reality then that's your reality. Try looking at the logistics of spraying the whole planet on a regular basis. First, you would need around a million pilots to do that (someone actually did the math on it). Next you would need about a Billion with a B gallons of chemicals. Ultimatly you need the leaders of the WHOLE PLANET in on the conspiracy. You think Israel is kerping quiet about their people being poisoned? Finally, how many pilots do you know? I know a whole bunch of them. Not weekend pilots, but people who have been doing it for decades. One flies commercially all over the globe, one flew for Dr. Phil, one is a Hall of Fame World record holder who has worked on pretty much every continent. If I were to name only a handful of films he's worked on you would have heard of every one of them. You think these people wouldn't have noticed something? You think they are complicit in poisoning themselves, their children, their family and friends?? Because of stuff you saw on Youtube? How EASY it will be for Satan to deceive.........use a little discernment. By the way, I'm not trying to start an argument but Youtube is probably the LEAST reliable source in the world for ANYTHING. "Unsealed" is my favorite website, and, I wouldn't miss it for anything! So informative! Thanks, Gary!